Tuesday's NI League Cup semi-final between Dungannon Swifts and Crusaders has been postponed because of a frozen pitch at Stangmore Park. A league spokesmen said the decision had been taken in the interest of player and spectator safety. 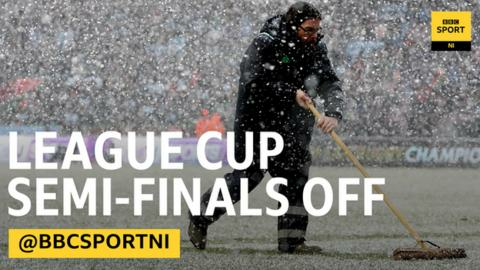 The other last four match involving holders Ballymena and Cliftonville had already been called off and both games will now take place on 16 January. The final is scheduled to be played on Saturday, 17 February. Last Saturday, four fixtures in the Irish Premiership fell victim of the cold snap. In the most recent meeting between the clubs, Crusaders beat Dungannon Swifts 4-0 in a league match on 22 November. Crusaders midfielder Declan Caddell would have missed the semi-final at Dungannon because of suspension. He will now have to sit out Saturday's league match away to title rivals Glenavon instead. The Crues will go to Mourneview Park unbeaten in their last 13 in all competitions, and having won eight and drawn the other of their nine away games in the Premiership.